When Mom Central asked if I wanted to be part of a blog tour for Schlage's Keyless Locks, I couldn't respond fast enough! I confess, I already have a keyless lock on my front door. When I lost DH's keys a couple years ago, we replaced our house lock with a keyless lock, and it has been the best thing ever! The kids are able to lock the door easily and also open the door. I don't have to fumble for keys ever! We can change the codes easily and have multiple codes in case someone is feeding the fish, for example. And, perhaps most importantly, I CAN'T LOSE THE KEYS! So, why was I excited about trying out another one? Because my parents own the house next door to mine and I am always in and out of their house. They live here part of the year, but we often go into their home (um, we use it for storage!) and my sister usually does her laundry there (keeps the water flowing!) I'm pretty good about putting the key back in the same place, but I can't say the same for other people in the family. I wanted to put one on their door to make everyone's life easier. My parents are currently living next door, and just last week my dad walked out of the house, locked his door, and realized all of his keys (truck and house) were IN his house. I wasn't home, but he was able to call my cell phone. I was able to tell him the code for MY door and he was able to go into my home and get the spare keys for his house. It saved him waiting 30 minutes for me to come home in the 110 degree Arizona summer heat. My parents are thrilled to have one on their door, now. It was very easy to install and my dad only needed a single screwdriver and about 30 minutes. The keypad lights up so you don't have to fumble if you forgot to leave the light on after dark. The lock requires a single 9volt battery, which comes included in the package! I can't recommend this type of lock enough! I tell everyone I know to change their lock to a keyless lock and make their life easier! You can check out more information on the Schlage website. If you have been thinking about ways to make your life easier, and your home more secure, I would consider a new keyless lock! Many many thanks to both Mom Central and Schlage for sending me this fabulous new lock! Hello everyone, I echo what Melanie's saying! 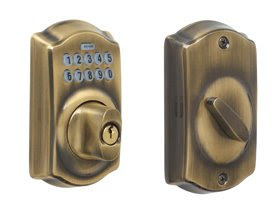 I bought one for our front entry door and back door 6 months ago from GoKeyless.com and finally have a way to go for a jog or take the dog out for a walk and no longer have to stick the house key in my tennis shoe. I remember the pre-gokeyless years and losing keys that would fall out my pockets, or my shoe, and would be so frustrated. The folks at GoKeyless were really helpful, I think I spoke with an Amy, who gave me some advice as to what style and finish would be best for my home. John D.
Wow - I had no idea there was such a thing for homes!!! I am definitely going to check into this and talk to DH about it! Thanks Melanie!